Losing weight is tough especially when it comes to curbing the urge to snack. Most of us have difficulty walking into a supermarket and walking out with unnecessary fattening snacks because of cravings. Finding a supplement that aids in suppressing appetite and assists us with losing weight is equally difficult. Saffron supplements have been discovered to assist with weight loss and suppressing appetite. Optimized Saffron with Satierea by LifeExtension has reported that it has found the formula to eliminate this problem by supporting a healthy body weight and targeting emotional impulses that cause you to eat more with the use of its patented formula of Saffron extract. Saffron is a powerful spice which is beneficial to many factors when it comes to health, however when it comes to weight loss, using a formula that is 100% pure Saffron is more effective than one which contains added binders like Microcrystalline cellulose and Acacia gum. There is not much information from the manufacturer on where the Satiereal Saffron is extracted from, this is a concern as Saffron can also be synthesized in some laboratories which does not give results as effective as 100% pure saffron. 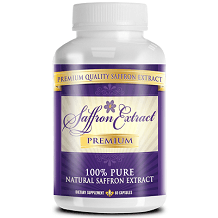 The recommended dosage of Optimized Saffron with Satiereal is 1 tablet, twice a day. Each capsule contains 88.25mg of Satiereal Saffron which is a total daily dosage of 176.25mg. This is a very low dosage as studies have shown that at least 400 mg of Saffron should be taken daily for effective results. Some possible side effects of Saffron include dry mouth, anxiety, dizziness, drowsiness, nausea, change in appetite, and headache. Consult a physician before taking Optimized Saffron with Satiereal if you are pregnant, breastfeeding or suffering from any medical condition. A bottle of Optimized Saffron with Satiereal retails for $36.00 for 60 capsules. When purchasing the product on the manufacturer’s website they offer a discounted price of $24.00 excluding shipping. Unfortunately, there is no money back guarantee when you purchase Optimized Saffron. Consumers may lose out on some hard earned money if they find that this product is not effective and may only be able to seek compensation if they have purchased this product through a third-party retailer, however, that doesn’t guarantee a refund either. After researching Optimized Saffron with Satiereal, we have found that there are a few things to like about this product such as the discounted price and natural ingredients, however, there are a few concerns we have. The extract of Saffron used in the product is not known and consumers may run the risk of potentially buying a product that contains a synthesized form of Saffron which may be ineffective. In addition to this, the dosage is below standard and consumers may not get the desired results. Since the manufacturer’s do not offer any guarantee this leaves us questioning the effectiveness of this product as it potentially eliminates any trust between the brand and consumer. When researching customer reviews, we found multiple complaints from customers stating that the product did not work. Due to the product not containing 100% Saffron, the low dosage and lack of guarantee, we cannot recommend using Optimized Saffron with Satiereal.